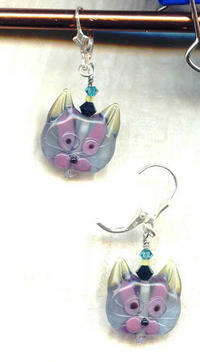 Name: Handmade Lampwork Glass Fantasy Cat Face Earrings - Kool Kat! Certainly these beads do, for the faces appear on both sides. The base of the bead is transparent aqua, highlighted with orchid, yellow, black and white. I've yet to see a live kitty in these colours, but perhaps this is the wave of the future. With the addition of co-ordinating Swarovski crystal bicone beads and sterling silver lever back earring findings, the earrings dangle a dainty 1-5/8" from the tops of the findings to to the bottoms of the kitty chins.